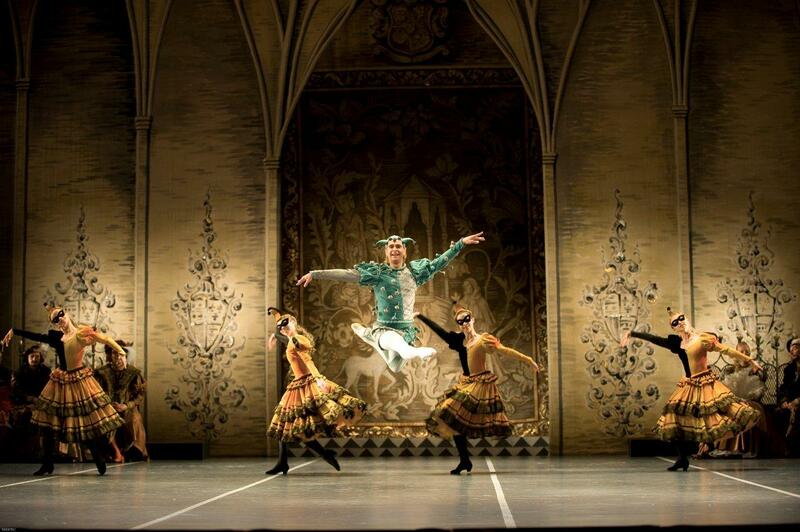 Mikhail Messerer, Ballet Master in Chief of the Mikhailovsky Theatre, said during a recent interview that he wanted success with British audiences and to expose the Company internationally. There can be no doubt that he has succeeded on both counts, just two years after their debut here. I was unable to attend the First Night of Swan Lake due to a prior commitment, and I opted instead to review Royal Ballet Principal Tamara Rojo’s Odette/Odile, as she is guesting with the Mikhailovsky. I wanted to see what she would make of the choreography & style of dancing, which is sharper, straighter, faster and in all probability, harder than the English style which is softer altogether. First of all I want to talk about the corp de ballet. Every swan was immaculately placed during every second of the performance, every foot and neck swooping as one. And they have a lot to do. I love the way that they are so much more ‘present’ in the pas de deux between Odette and Prince Siegfried, rather than simply framing the central couple or giving them a break between solos. When Odette practically expires, lying just as a prostrate swan would, so do they, collapsing quickly but elegantly. It’s something you won’t see in an English production, and they are all the more swan-like as a result. Their tutus are more cupcake than plate, but plush and downy. Regular readers will know that I have been charting the progress of Isabella McGuire Mayes for a couple of years now. Isabella is a student at the Vaganova Academy (and still the only British girl) and was invited to dance in the corp for the Mikhailovsky’s Swan Lake – a huge honour. To her credit, she blended in seamlessly with the sharp footwork and soulful eyes required of the Company dancers, and she has two more years of training to go. 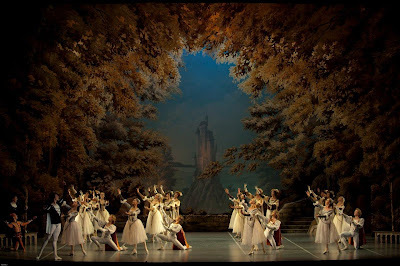 The ballet begins in a creamy-brown setting in the garden of the Princes’ Mother, the Sovereign Princess, where she tells him that he must find a wife at tomorrow’s ball. There is some lovely ensemble dancing with the ladies generally faring better than the men. The Pas de Trois is well danced though slightly out of sync – they almost looked as though they didn’t have enough room. Oksana Bondareva, a second soloist, was a wonder; high jumps and a smiling face. Once the Prince (Artyom Pykhachov – a late replacement) is on his own, he takes the path to the forest where he stumbles upon a swan, who turns into a girl right before his eyes. The audience knew who this emerging lady was – Tamara Rojo – and warmly applauded her arrival. Together they danced the pas de deux wonderfully, but with Pykhachov himself, I had worries as soon as he left the ground. His first solo was unsteady; his spins are better than his jumps but he seems to have duck-billed feet. His extensions are very long & high but the transitions were weighted and laboured. There is almost no mime in this version to tell the story, which races along at a fair old lick under the baton of the wonderful Pavel Bubelnikov. As dawn approaches, Odette must turn again to a swan, and The Evil Genius pulls her magnetically towards him. Danced to perfection by Vladimir Tsal, whom I would love to see dance Prince Siegfried, The Evil Genius has short, stumpy wings, rather more crow-like than we are used to. At times when he lifts Rojo, his wings seem barely able to grasp her, wisp that she is, but in the final scene they really showed their usefulness as she is spun around and around and around by The Evil Genius – long wings would have certainly detracted from that moment of theatre. Tsal was the male genius of the night. His jumps were high, sound- and- effortless. What an explosive partnership he and Rojo might make. 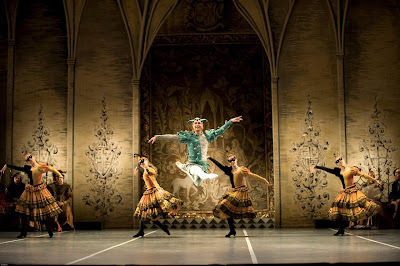 As this is a Russian production, there has to be a Jester, and here Denis Tolmachov has the requisite technical arsenal but he is shorter than the corp dancers and so low to the ground that I found he hardly made an impact in the air, good though he was. One of his costumes, inexplicably, was adorned with pom poms of independent spirit – they literally had minds of their own. He already has a typical Jester’s regalia; I’m not sure the pom poms were an inspired addition. 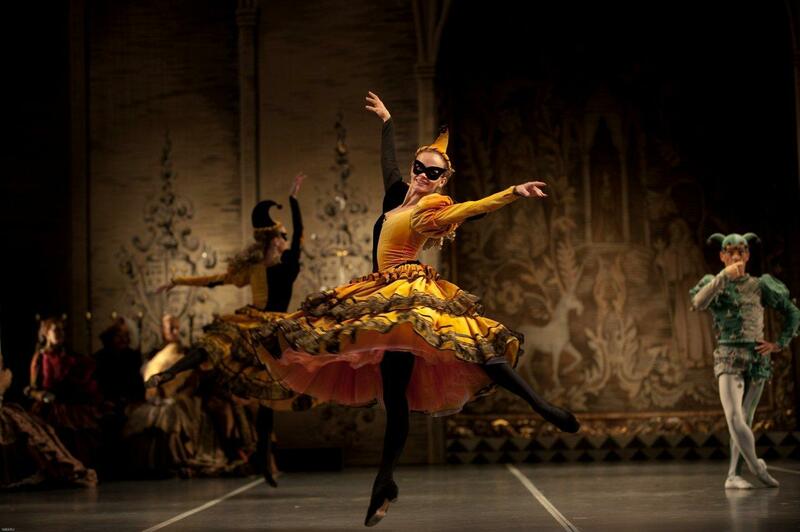 Overall the costumes are sumptuously stunning. The six Princesses have dresses made from air and stars, while the Spanish Dancers had long dip-dyed dresses swirling & sparkling heavily about their legs. And my goodness, those Spanish ladies (Mariam Ugrekhilidze and Kristina Makhviladze), had taken lessons in España from Rojo herself. I have never seen such astonishing backbends – head arching over and back towards earth and at whip-cracking speed too. Fantástico ! The four cygnets, Yulia Tikka, Marina Nikolayeva, Ekaterina Khomenko and Sabina Yapparova had perfect timing & perfectly fleet feet. The Big Swans – three of them – were equally together and eye catching. Once the ball gets cracking in the Black Act, the costumes step up a gear too, which you can see from the photographs. Lots of two toned tights in black/white, black/mauve, which must be a nightmare for the wardrobe department because the corresponding boot has to match the leg wear. Beautiful long dresses with very fifties nipped in waists in white silk with black detailing (reminiscent of the very best wallpaper patterns but better because they move), contrasting with orange and black with a hint of peach in an upturned skirt, moving to high octane scarlet and black for Odile. Rojo looked simply devastating in the black tutu with a splash of blood red; there was no doubt that she would get her way and she seemed to do it pretty much without the usual goading of The Evil Genius. I like the way that the Principal couple for each of the National dances interacts with the other couples – entering the stage from opposite sides, leaving the other couples to dance and then returning to dance with them. It makes for a lot of tambourines in the Neapolitan though ! The Princesses, with their aforementioned utterly heavenly dresses, danced beautifully for the Prince who took little notice. The look on each of their faces as he rejected them was priceless ! He’ll not get a second chance & he'd better not end up in their neighbourhood if things go pear-shaped with Odette. Once the Jester flies in, pom poms aloft, heralding the arrival of an unknown guest, it’s not long before the Princes’ deception of Odette is complete, though in this staging he does actually get to see Odette flapping furiously, trying to stop him from behind the screen, so I’m not sure why he carries on regardless (in most productions, Odile shields his vision or he turns away at the crucial moment and doesn’t see Odette until it’s too late). Rojo is unparalleled in the art of fouttés – she can whip off a quadruple with a cherry on top and still have time to flash those eyes & make you wonder what she'll do next. Her balances drew applause from the audience – nothing unusual there – but this time I saw absolutely no sway whatsoever, forever, or so it seemed in the expectant hush. In accordance with Russian tradition, the ending is happy one, but not before Odette returns mournfully to the lakeside to tell her friends that they too have been betrayed. Rojo has the world’s most expressive face and port de bras, and her eyes, busy with memories and sadness, almost weep as the corp gather and dance with her. Her arms carry the weight of a thousand betrayals, and she lies prostrate on the ground, protected by her swan friends until Prince Siegfried arrives and defeats The Evil Genius. And it is genius too – pulling off a wing reduces him quickly to one of those insects you see squirming on the ground trying furiously to get upright again. Brilliantly acted by Tsal. Our happy couple head off towards, we think, a happy future, with the corp showing the way. This production is an absolute delight to watch. The costumes are inspired – licks of a hat here and there; long white gloves (for the Prince), with atmospheric sets and spirited dancing all fairly racing along. It was ten thirty before I knew it. 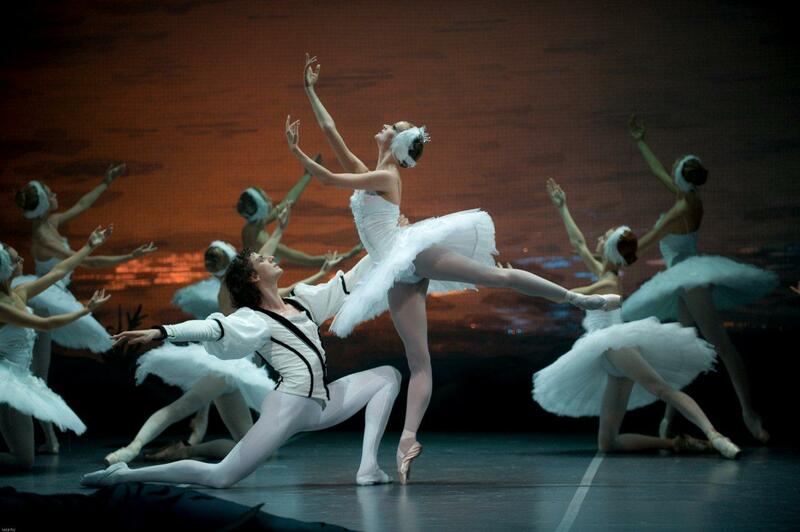 Swan Lake is in rep until Sunday 25th July. Please don’t miss it – it’s been two years since the Company were last here so if you miss this visit, you might have quite a wait for the next. This sounds a dazzling production, & what a good review! Also nice to hear Isabella is doing so well. Thanks for all the detail. I too was lucky enough to see The Mikhailovsky's Swan Lake but with Polina Semionova as Odette/Odile last Saturday - she is a favourite dancer of mine and did not disappoint! However, what has prompted me to comment is that I am so pleased you rate Vladimir Tsal so highly - I think he is the unsung hero of this production and I could not agree more that I would have liked to see him in the role of Prince Siegfried. I think he would indeed be the perfect Prince! Anne - thank you ! Couture Carrie - I think almost everyone does. It's the iconic ballet even if you know nothing about ballet. Every girl's dream at some point too I think ! CelticWoman - thank you, they really were stunning. I knwo what you mean about the music - after so many Swan Lakes this summer I'm pretty much the same - but not complaining ! Scarf Addict - so pleased you agree! I can't understand it myself. I guess it's politics but it's clear that Tsal could be doing more. Great review! Swan Lake is always one of my favorite ballets. The costumes look especially great in this one! And I love watching a good set of fouttes!